Yesterday I asked the great Reuben Frank on twitter when the last time was that a pitcher threw 200 innings, had an ERA as low as Cliff Lee, and won 6 or fewer games. The answer was incredible. Here’s that story. Thanks Roob for letting me know. Cliff Lee is having a year for the ages. Lee has thrown over 200 innings. He has 6 wins. He has a 3.12 ERA. The last time a pitcher pitched this well and got screwed over this badly by his teammates? His name was George “Pea Soup” Dumont, and the United States was in the midst of World War I.
Dumont was born in Minneapolis, and started his pro career in the minors with the incredibly named Fargo-Moorehead Graingrowers. He came into the league with a bang, throwing 2-hitters in each of his first two big league starts with the Washington. But the success wasn’t sustained. 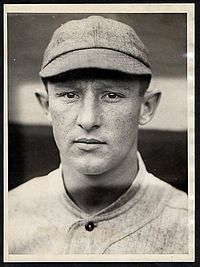 In 1916 he battled injury and illness, and spent most of the season in the minors. In 1917, he was awesome…but simply couldn’t earn Ws. (It kills me that baseball-reference’s game logs go back to 1918, but not 1917. You have to think he had a ton of 1-0 and 2-1 losses.) He finished the year with a 5-14 record, despite a 2.55 ERA. Brutal. By contrast, team superstar Walter Johnson had an only slightly lower ERA that year (2.21), but a 23-6 record. Nonetheless, he was only 21 years old and appeared to have a bright future. Appearances can be deceiving. In 1918, he went to work in Wilmington, Delaware as part of the War effort and missed most of the season. In the 1918 offseason he was dealt to the World Champion Red Sox in exchange for several players, including the incredibly named Slim Love (how is there not a rapper named Slim Love? Seriously.) He struggled in Boston, going 0-4 with a 4.33 ERA in only 35+ innings of work. He was then sent to the minors, where he spent the rest of his career. He was once signed by the Yankees, but didn’t get along with manager Miller Huggins and thus didn’t make the team. He returned to Minneapolis, where he became a car parts foreman and later a tavern owner. Musta been pretty cool to grab a beer at that tavern and listen to the bartender talk about former teammates Babe Ruth and Walter Johnson..and about the year he got hosed by his teammates. To learn more about George Dumont, be sure to read his SABR project page.